Is it possible to run an effective influencer marketing campaign without a big marketing budget, only by creatively engaging influencers? 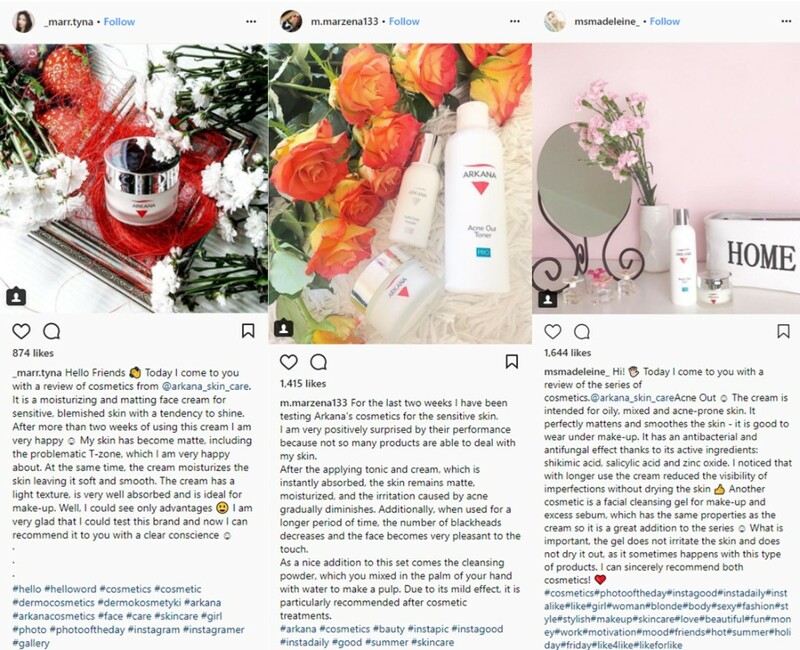 AdCookie decided to invite 100 organically selected female micro-influencers to cooperate in the campaign for the Arkana cosmetics brand, focusing not on the range, but first of all on the value of the message and the level of audience involvement. With virtually no budget for advertising, but with the range of brand’s products and a precise action plan in hand. How did we manage to generate more than 180 branded posts, with more than 160,000 reactions underneath? And if you plan your own influencer marketing campaign, how should you choose the right influencers and how do you go about the cooperation? We will try to answer these and more questions in the below case study and we hope you will be able to draw some conclusions to use in your future campaigns. Customer – Arkana Cosmetics brand is a Polish manufacturer of dermo-cosmetics already well known among beauty salons and industry professionals, and now building its recognition among retail users. Very little activity and brand recognition on Arkana’s Instagram before the campaign’s launch. The need to select those Instagrammers that would cooperate through barter instead of posting paid reviews or publications. Lack of budget for paid promotion of the posts. Increasing Arkana’s presence on the Instagram. Increasing the number of followers on the @arkana_skin_care profile, with a simultaneous increase in the engagement. Getting high-quality relevant content, valuable product reviews, and relations based on authenticity. Raising brand awareness and educating younger audiences as potential customers. Building partnerships by selecting the best influencers for future cooperation on new lines of cosmetics. The first stage is, of course, a strategy, devising a plan of action and a roadmap for its implementation. One of the most important elements was in-depth research of the Instagram. AdCookie experts analyzed several hundred profiles. First, we focused on matching people with the campaign and products, and then, we analyzed the reach and engagement of selected Instagrammers. A manual selection was then carried out and supported by an automatic selection using the Brand24 tool. “When selecting the right Instagrammers for the campaign, we did not rely solely on tools, but we used them to support our organic work, which was the base. The research was carried out on our own. When choosing the influencers, we checked their content, analysed the pictures they took, looked closely on how valuable their followers are, whether they were involved, whether you could see the connection between them and the person in question, etc. Based only on the tools, the main criterion for choosing the bloggers would be the range, which wasn’t our top priority. 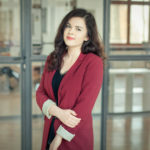 This is because we are all too familiar with situations where the influencer has 100 thousand observers, and under their content, there are not even 50 likes”, comments Justyna Bajowska, adCookie’s Social Media Expert who was in charge of the Arkana project. An important aspect of the campaign was the valuable, honest feedback we got from the influencers on the product, even if it did not fully meet their needs. During the research stage, we chose not to rule out the less popular Instagrammers, nowhere to be found in the most popular influencer rankings. On the contrary, we sought to cooperate with these micro-influencers in the first place. “We focused on engagement and close relations between instagramers and their audience. As a result, we managed to attract 100 female influencers, with a combined range of over 1,700,000 followers. We could clearly see that they had a genuine, natural influence on their audiences”, explains Justyna Bajowska. The process of selecting and recruiting influencers lasted about six weeks. AdCookie experts conducted comprehensive interviews with each of them. We surveyed each influencer’s willingness to cooperate, learned about their age, details about their daily skincare, the type of skin and the problems they face on a daily basis. Based on this information, Arkana’s specialists selected the products to be tested. The Agency was also open to the ideas coming from the Instagrammers; after all, nobody knows their target group better than the influencers themselves. “As for the content selection, we relied on the experience of our influencers. We did not impose any guidelines or templates on them for implementation. Sometimes brands impose their requirements, give instructions on the appearance of the photos or the content of the posts. We were not afraid of bad opinions either. We emphasised the professional character of the brand. We were also prepared for the fact that a product might not match the skin type of the testing person exactly. In these cases, the influencers would inform their followers for whom the cosmetics were intended. What we wished for were genuine, reliable opinions. How the Instagrammers gave those opinions was up to them,” adds Justyna Bajowska. Of course, the product itself and its quality are crucial for this type of campaign. Reviews must be reliable and authentic to show the true image of the product in the natural style of communication. This authentic narrative will also be beneficial to the fans, who should find the products presented in this way genuinely interesting. Apart from selecting the right people, it was essential to keep in touch with them and to guide them through the whole process. The key to the campaign’s success was also our prompt responding to brand mentions and followers’ comments – also on the influencers’ profiles. In the analyzed period, the activity of the Arkana’s Instagram admin went up by 257% compared to the previous period (data according to Sotrender). Finally, the influencers were encouraged to add a reliable opinion about the cosmetics on Opineo.pl, Poland’s leading review aggregator. The Agency monitored all activities through Brand24 and Sotrender. Thanks to this, it was possible to keep track of all new mentions of the brand in social media, blogs, and forums and to analyze the engagement and reach of the posts, and to participate in selected discussions. We also tracked Arkana brand tags in Insta Stories. “Cooperation with adCookie agency in acquiring bloggers for brand promotion brought very good results. Thanks to the professional reaserch, adCookie made it possible for us to cooperate with the most objective influencers on the Instagram. We obtained over 180 reliable entries, which clearly translated into recognition of the brand and its products, and ultimately into increased sales”, comments Katarzyna Wyszyńska, Network Marketing Specialist in Arkana Cosmetics. 0 – budget for cooperation with influencers and content promotion. 1,720,000 – combined reach. More than 100 of the Instagram’s most objective influencers with a total range of more than 1,720,000. More than 180 published posts on Instagram and blogs with the brand name + 194 Instagram Stories (added by the influencers). Likes on influencers’ posts (with brand mentioned): 163 122. Comments below the influencers’ posts (with brand mentioned): 7 833. Profile of Arkana brand – the quarterly assumptions of monthly growth of the numbers of fans were exceeded three times. Reviews – people involved in the campaign were asked to share their opinions about the products, which resulted in a significant increase in positive opinions about the Arkana store! Finally, taking into account all the projects and the effectiveness of the cooperation, adCookie selected the 20 most involved influencers and invited them to further cooperation for promoting the new collection of Arkana Cannabis Therapy MD through influencer marketing. The results achieved clearly answered the question of whether a wide range is always a guarantee of success. In the case of authors with smaller reach, what really counts is the community, its involvement and willingness to interact with the influencer’s content. The key is the ability to select the right creators for the campaign. What follows is a smooth implementation and ongoing measurement of results, which also cannot be overlooked.